Glo is at it again with this give away , and I'm really confused because of the way all of the networks are dashing out promo's and giveaways . Lol . They all are trying to keep up the game and also secure their subscribers. But anyways Nigerians are not yet satisfied . 'not even soon' . This Giveaway from Glo is a way of rewarding active subscribers to keep on being active. 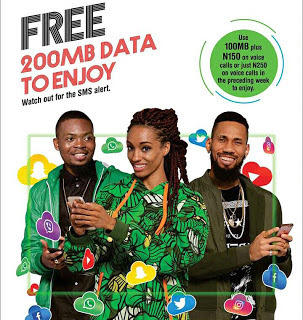 As Glo is Giving out 200MB worth of Free Data to browse for 7 days , to subscribers who recharge their lines often . This offer doesn't select tarrif plan as it is general . To be part of this offer you should be an active subscribers and you as little as N200 on voice call or N100 and N100 on data . Note: It's not a cheat , as it doesn't require any VPN to use it. It works on all Device and Tarrif plan . Just fulfil the above requirements and you will be credited 200MB free data asap to browse for 7 days . This is to hold Glo members down. make i run go get my. Heheh, This Girl Stopped Picking My Call After I Told Her That The Colour Of My Blood Is Green. God Knows I've Been Sitting On The Throne And Rulling My World. If Only Glo Could Work On Their Network In Major Part Of The Country, Am Sure Slay Mamas And Dapper Dudes Would Patronise Them. Lol , I'm actually rolling on the floor , you're so funny .